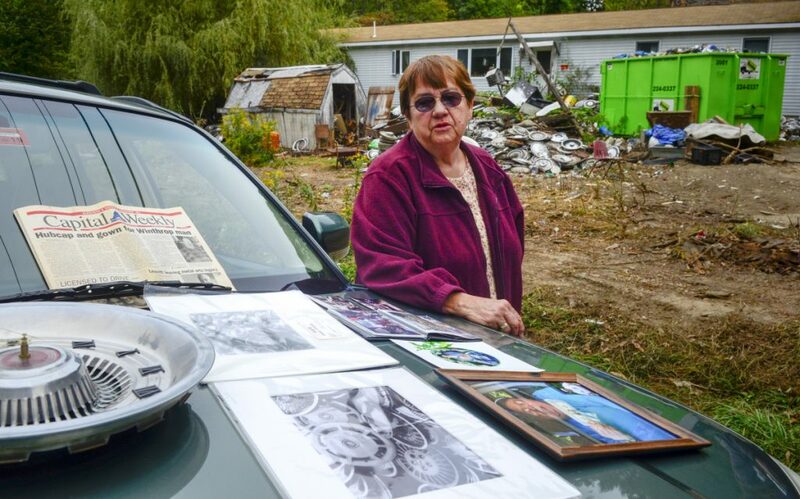 Sincer Arthur Hawes died in June, his family has been removing thousands of hubcaps from his home on Route 133. WINTHROP — On a nice day, they could be annoying. In stormy weather, they could be hazards, occasionally tempting bolts of lightning or taking flight on a heavy wind. 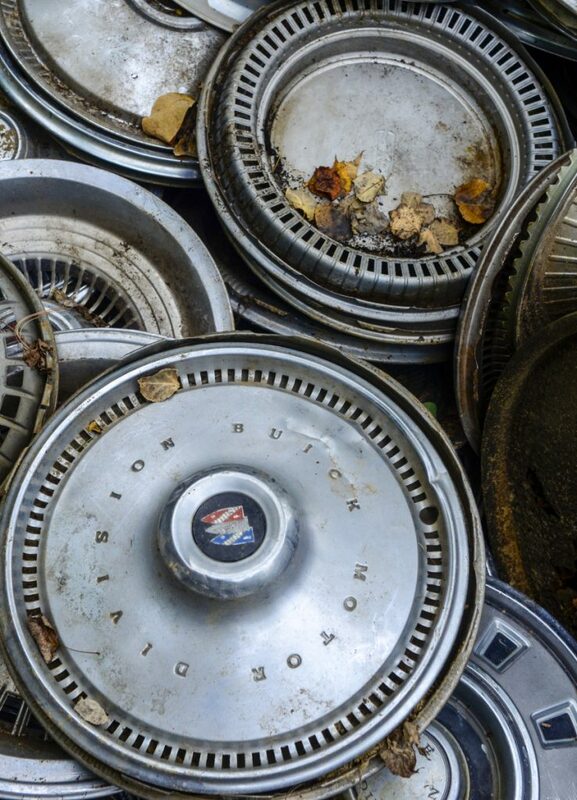 But now that they’re going away, Margaret Hawes is having a change of heart about the thousands of hubcaps that lay across her yard for decades. Anyone who regularly drives from Winthrop to Wayne on Route 133 probably knows the Hawes place: A small white house on the right — and the sea of chrome that surrounds it. 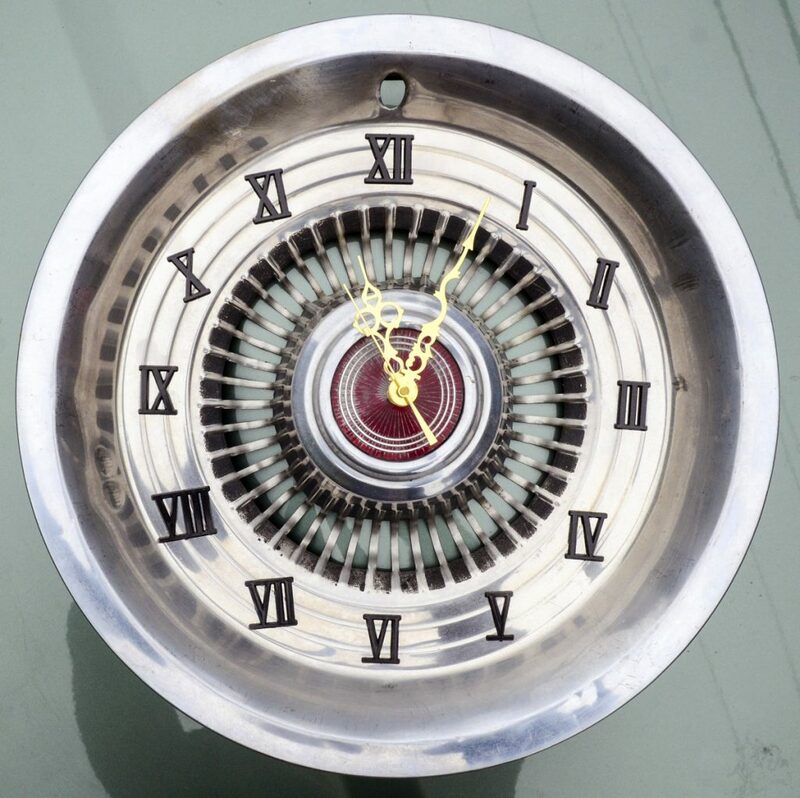 The hubcaps started to accumulate in the early 1980s, when Margaret Hawes and her husband, Arthur, decided to hold a yard sale on their 1-acre Winthrop property. 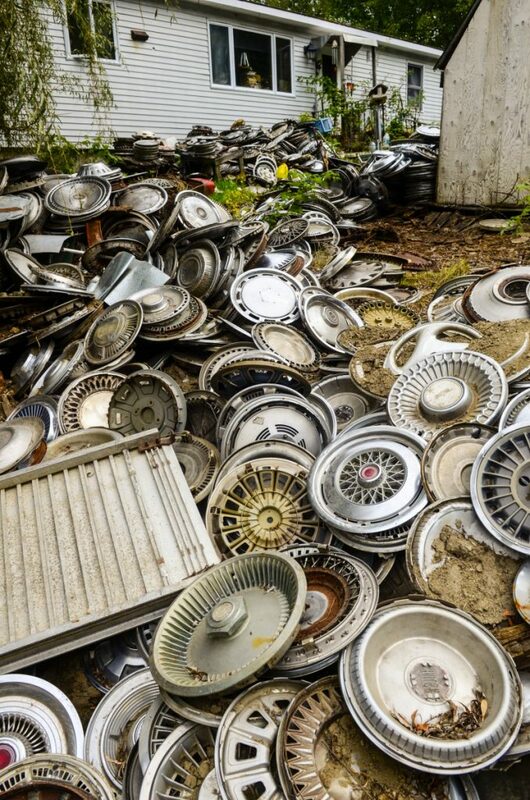 They found 12 hubcaps at a junkyard that they figured someone would want. On the day of the sale, the caps went before anything else. 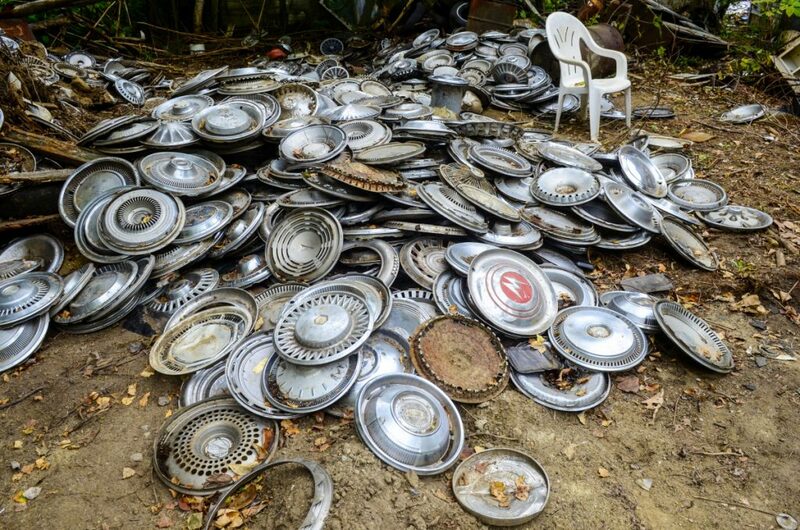 By the mid-1990s, the whole front lawn, and much of the back, was covered with hubcaps he’d found at junkyards, warehouses and other places. At its peak, the property held more than 30,000, Margaret Hawes said during a recent interview. To walk from the front door to the edge of the property, they had to clear a 4-foot-wide path. That started to change last year. After living in the home for almost 48 years, the Haweses moved to an apartment in downtown Hallowell. Then, on June 9, Arthur Hawes died at the age of 76 after a struggle with kidney disease. Now Margaret Hawes says she “can’t afford to keep this place” and hopes to sell it in the coming years. 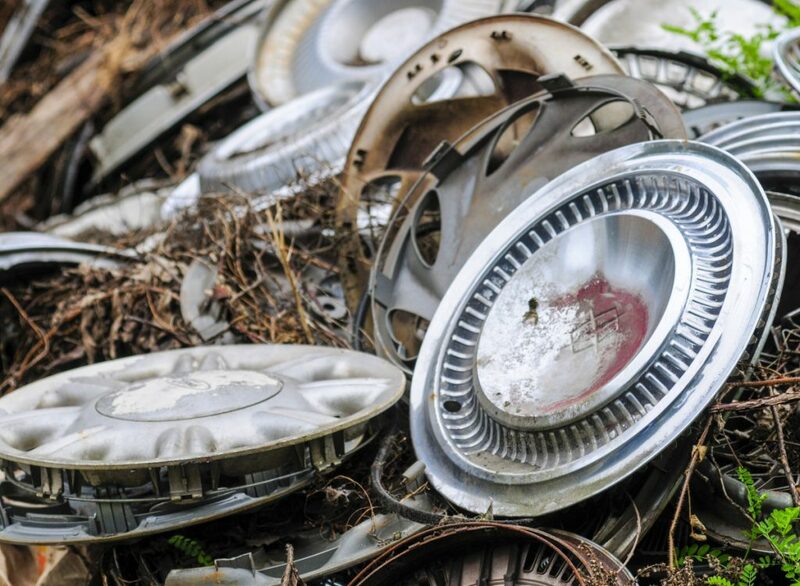 Starting in late September, a tow-truck operator from Livermore Falls gradually has been carting all the hubcaps to salvage yards around central Maine. 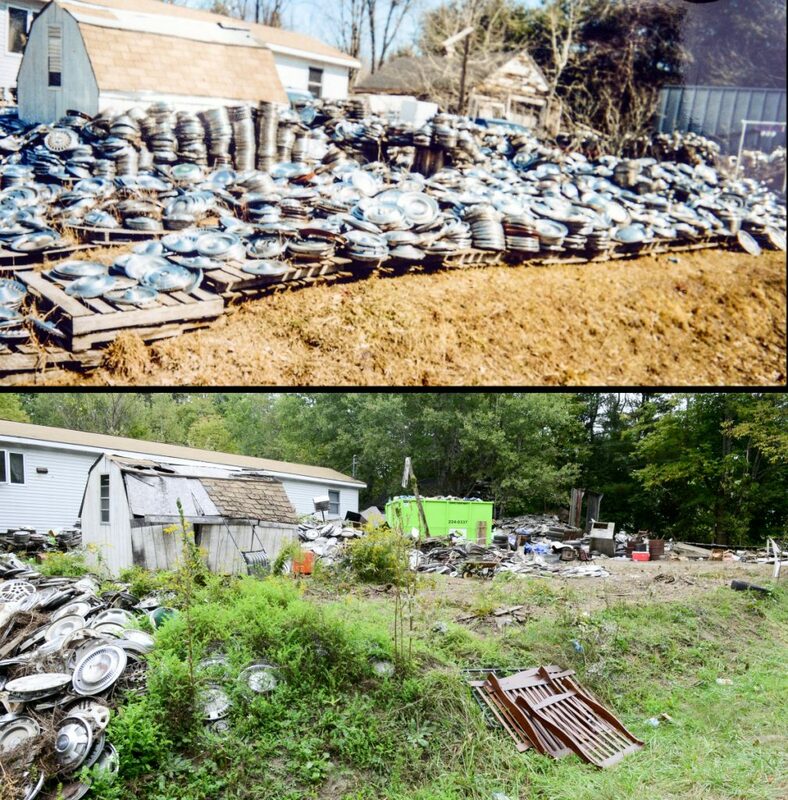 The top image is a Hawes family photo from the late 1990s, and the bottom image was taken on Tuesday, days after pallets of hubcaps had been taken away at the Haweses’ former home on Route 133 in Winthrop. 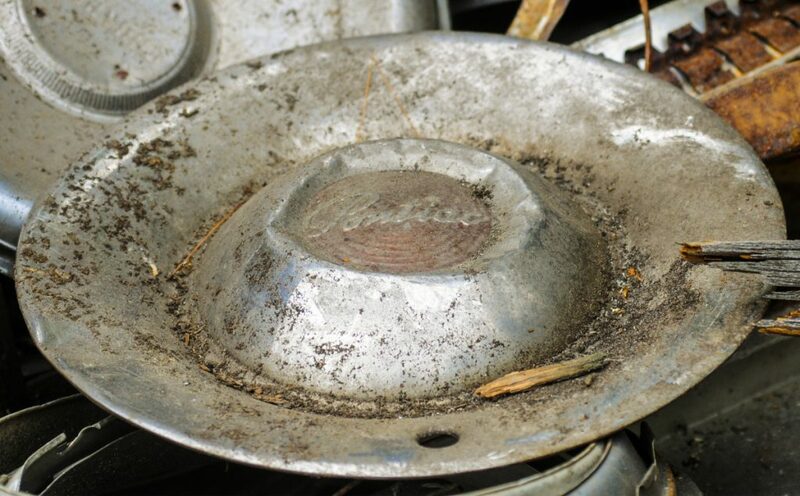 Last week, Margaret, who is 71, and other relatives came to the home, where the sprawling pile of hubcaps has receded more than halfway up the front yard. They remembered Arthur as a kind man who worked a string of jobs to provide for his family, including at a shoe factory in Hallowell and the Carleton Woolen Mill in Winthrop. They marveled at the decision he made later in life, at the age of 55, to complete an adult education program and earn the equivalent of a high school diploma. He also was an entrepreneur, selling eggs from chickens that he raised and fish that he purchased from the coast. 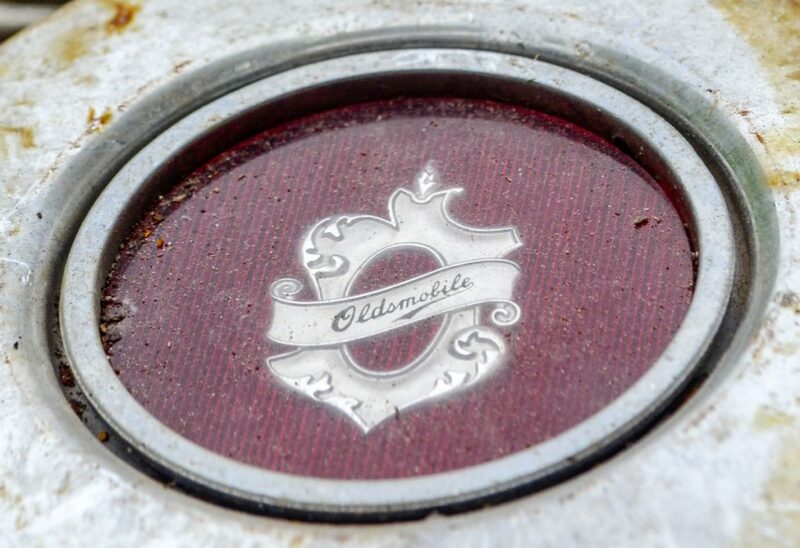 In that spirit, Arthur and Margaret Hawes also helped people find matching hubcaps for their Fords, Cadillacs, Studebakers, Toyotas and other rides. At their home at 421 Route 133, they tried to organize the caps into piles that corresponded to their makers, but they kept the most prized ones inside. 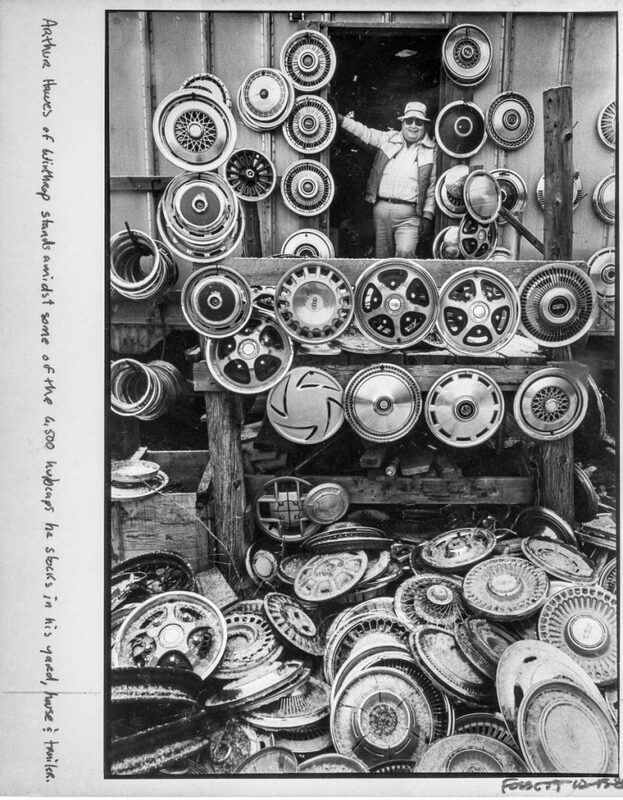 Anyone wanting hubcaps could leave a donation, said Margaret Hawes, who helped with what she called her husband’s “hobby.” Once, their system was so organized that when someone came searching for a specific type of hubcap in the dead of winter — Margaret couldn’t remember if it was a Pontiac or Chrysler — she immediately found it under more than 4 feet of snow. Their children and grandchildren also helped. “It kept us out of trouble,” said their 51-year-old daughter, Mitzi Brown. 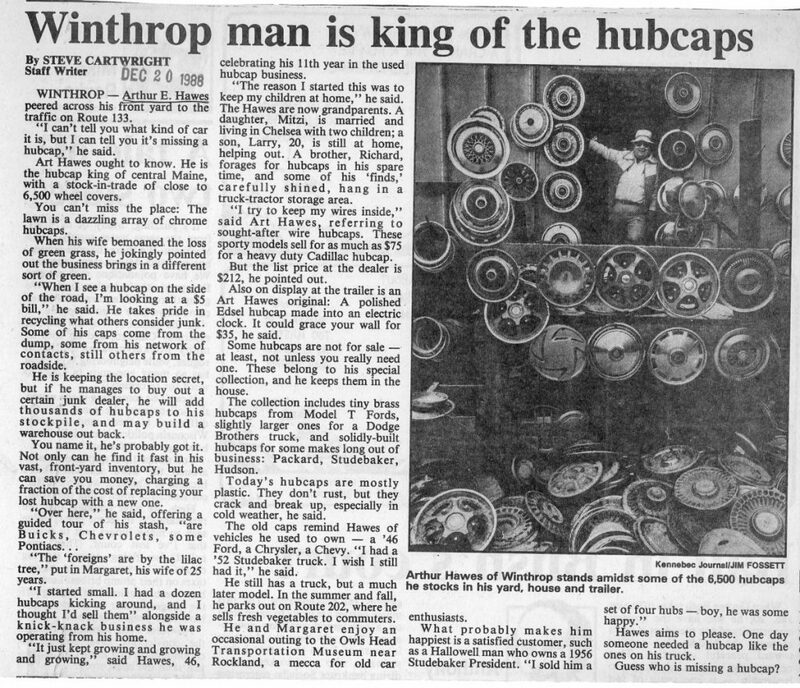 But Margaret Hawes acknowledged another fact about her husband, known around Winthrop as “the hubcap man”: He collected plenty of other objects, including tires, wrenches, refrigerators, jigsaw puzzles, Christmas decorations and several old vehicles. A full-length yellow school bus still stands in their backyard. He developed that instinct growing up in the period immediately after the Great Depression, said Rhonda Hawes, a daughter-in-law who is married to Arthur and Margaret’s son, Arthur “Larry” Hawes. Clearing the property has been bittersweet for the family members, given the memories it has brought back about their husband, father and grandfather. They also recognize how distinct the property remains to people who regularly drive from Winthrop to points northwest, such as Rumford and Rangeley. “It’s not going to be known as the landmark of hubcaps anymore,” said Anna Golden, the adopted daughter of Arthur and Margaret Hawes, who also visited the property last week. But archaeologists should take heed. At least one relative, Rhonda Hawes, wasn’t so sure the land would give up its title that easily.